Take advantage of more powerful and consistent stopping power without needing to change your levers. 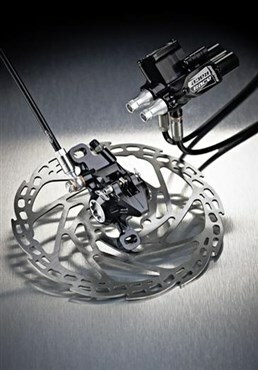 The Hope V-Twin is a hydraulic remote disc brake system for road bikes that allows you to control hydraulic disc brakes with conventional levers. The V-Twin master cylinder system fits neatly under the stem and connects to any cable operated lever including the STI levers commonly found on drop bar bikes. This means that you can convert your bike (with disc brake frame mounts) to hydraulic disc brakes without needing any expensive drivetrain upgrades. You can choose whether to pair the V-Twin remote with either the lightweight win cylinder X2 calliper of the more powerful, four cylinder E4 calliper. Make your hydraulic disc brake conversion that bit easier with the Hope V-twin remote brake system.